BrilliantStore, online at BrilliantStore.com, is your destination for electronics, home and garden accessories, and health and beauty products. 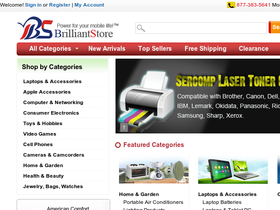 BrilliantStore sells laptops, laptop batteries, keyboards, and accessories for Macbooks, iBooks, and Powerbooks. BrilliantStore also carries refrigerators, freezers, cookware, hair dryers, massage chairs, toys, cell phones, and video games. You can also find make-up, fishing gear, cameras, camcorders, watches, sunglasses, handbags, and wallets at BrilliantStore. RetailSteal.com offers the best BrilliantStore promo codes, BrilliantStore coupons, BrilliantStore coupon codes, and BrilliantStore discounts. Shipping and handling rates at BrilliantStore depend on the item purchased and the shipping destination. Free shipping is offered for orders $50 and over that are shipped within the Continental US. See website for full details, exclusions may apply. Enjoy an 8% discount on all non-sale items when you use our coupon code online at BrilliantStore today. Head over to BrilliantStore and save 20% when you use our exclusive coupon code. Get 10% off any $50 online order and get free shipping using the coupon code at Brilliant Store. Click to save. Use this coupon code on Brilliant Store to save 10% on your entire order. Click to save. Use this coupon code on Brilliant Store to save 5% on your entire order. Click to save. Shop at BrilliantStore and receive free shipping on tons of select items. Save up to 25% on laptops and tablets online at Brilliant Store. Click link to purchase. Shop at Brilliant Store for Wii accessories, starting as low as $1.99. Click here to shop. SignUp for BrilliantStore's email list and receive a free gift.